Which Bid4Assets auctions require a deposit? Most government auctions will require bidders to submit a deposit prior to the start of the sale. How do I submit a deposit? The following methods are currently accepted for submitting bid deposits to Bid4Assets. 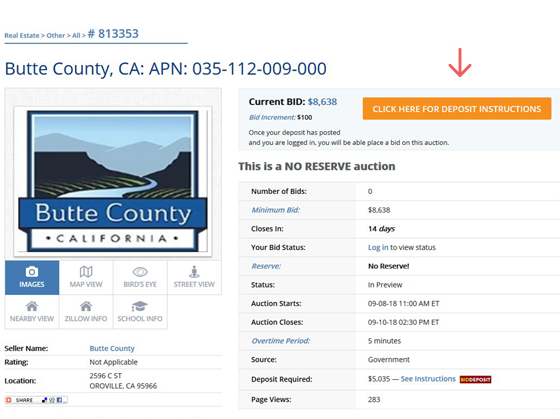 You can find instructions for sending your deposit on an auction’s storefront page and individual auction page. For your first deposit, you will need to provide your social security number. Bid4Assets is under federal requirement to collect this information by the US Patriot Act. Bid4Assets does not sell or trade our subscriber’s private information. Next, you will be prompted to choose your deposit method. Again, the two options currently available are certified check or wire transfer. The next page will provide you with all the information you need to submit a deposit (Bid4Assets’ bank name, routing number etc.). All of the information required to process your deposit is displayed on this page. We recommend printing this page out and taking it with you to the bank. 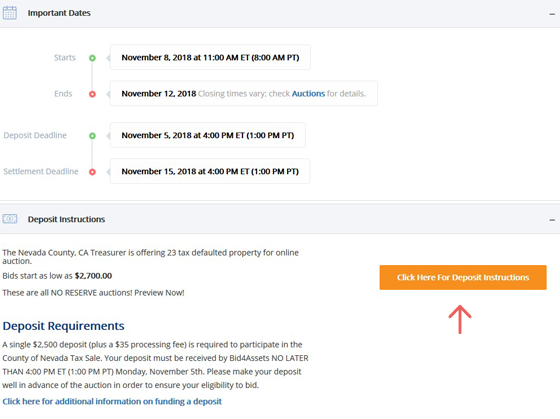 What if I want to bid on more than one property? One bid deposit qualifies you to bid on every item in the government sale. If you want to bid on more than one property, you still only need to submit one bid deposit. Yes. If you ultimately do not participate in the sale or do not win any properties, your deposit will be fully refunded to you, with the exception of a $35 processing fee for certain sales. Can I use my deposit to bid in other government sales? No. 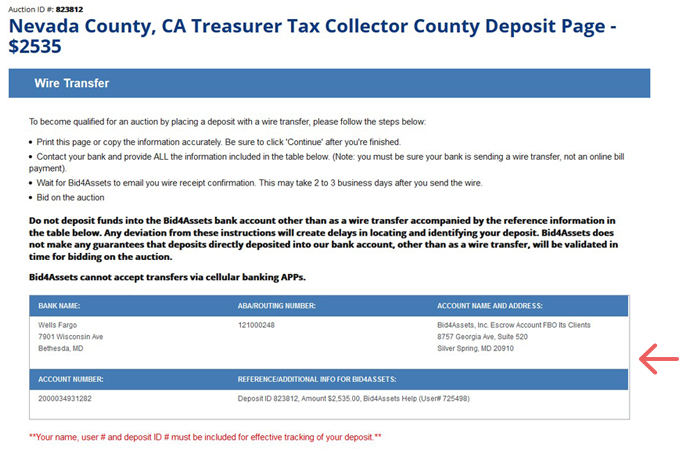 If you want to participate in another county tax sale or government auction, you will need to submit a separate bid deposit.